The weather is looking like it might be ideal this weekend. Fall colors, while probably not in peak splendor, will be enjoyable nonetheless. A volunteer pre-ride is scheduled for Friday (Oct 20), so please be sure to check back late Friday for any last-minute corrections. In response to several inquiries, I have updated the RideWithGPS files for the routes. As always, the cue sheet controls in the event of any discrepancy with the GPS file. A hint for the 200k riders: there is a change to one of the controls. Don't miss it! With the summer R12 events behind us we return to our rando clubhouse at the Weisel Youth Hostel for the always popular Fall Classic featuring a 200k brevet and a 150k populaire. Event and registration details have been posted on the website. As always breakfast will be available 1 hour before the start and there will be a post-ride cookout to replenish expended calories and swap stories about the year's accomplishments. We will also take time to recognize those riders who have joined (or rejoined) the PA SR club and the PA R-12 club and offer congratulations. With only 10.5 hours of daylight available, 200k riders will need lights and reflective gear unless you have a history of faster finishes. All riders are encouraged to get into the winter habit of riding with lights and reflective gear. You are also reminded that we are nearing the minimum order quantity for the PA Randonneur wool cycling jerseys. There are certain to be a few examples of the first generation jerseys at his event should you wish to check out the quality. Bill Olsen has tens of thousands of kilometers on his so he is a good person to ask about the durability of these jerseys. Several members have asked about non-wool jerseys. We are currently working with Ascend Sportswear to replicate the iconic look of our wool jersey in modern materials and plan to have material and sizing samples available for you to try on. You'll find sizing charts here. The order process is a little different as you will deal directly with Ascend. An on-line "store" for PA Randonneurs will open for a period of time during which you can place your order. There is a minimum order requirement that once satisfied will allow the store to close and the jerseys will go into production. Delivery is approximately 5 weeks after the store closes. I will provide more details in a separate message once I get those details ironed out. Mark your calendars and make plans to attend. The Fall Classic has been around since the very beginning of PA Randonneurs and is always a good time. The wait is finally over. PA Randonneurs is working with Woolistic to produce a limited run of the PA Randonneurs wool cycling jersey. These will be the same as previously produced and available in regular weight Merino wool long and short sleeve as well as the Superlight Merino wool in short sleeve. Regular weight short sleeve jerseys and long sleeve jerseys are available as well and will be a separate order depending on interest and ability to commit to the minimum order of 25 pieces. We will need 50% down to order these because Woolistic will need to order our custom orange color yarn and will take some time to make. Patience Please! Fine wool jerseys are like a custom frame, much hand work is involved. Also highly recommended are the Woolistic black cycling shorts! Order them yourself directly at: info@woolistic.com . They are super comfortable in summer and winter for long rides and they wear very well! PA Randonneur member George Retseck is coordinating the effort. He has one sample jersey in hand in size small. Contact him if you would like to make arrangements to see it or try it on. There are many of these jerseys out in the wild, so you may have already seen them and perhaps even arranged a private fitting with a friend. The order form is available at: http://parando.org/JerseyOrderForm.html We are now accepting payments through PayPal. Just click the "Submit Order" button and you will see the option. We couldn't have asked for a better day for a brevet. Almost chilly conditions at the start soon became ideal cycling weather with generally gentle winds that aligned to be quite favorable for the final 50 miles. All twenty-one riders who clipped in at the start finished for another 100% finish rate. Results will be submitted to RUSA in a few days and will become final pending ACP certification. One might have suspected there was a special equipment requirement for this brevet. A total of SIX riders completed the route on fixed-gear bike. Inducted into The Order of the Iron Knee are CJ Arayata, James Haddad, Guy Harris, Greg Keenan, Jeff Lippincott, and Rudi Mayr. While the second half of the route is generally fixie friendly, these riders had to persevere through the constant up and down of the first 50 miles to get there. Congratulations to freshly minted randonneur Richard Ramage who completed his first brevet with a smile on his face. He was heard asking about the next brevet, so I expect that we'll see more of him. Finally, with the completion of an ACP 200k, first finisher Sean Connelly also joined the ranks of PA Super Randonneurs for 2017. He blazed around this route in less than 8 hours, setting a mark that will surely stand for quite a while or until he rides this course again. Finally, thanks to volunteers George Metzler and Jeff Lippincott. 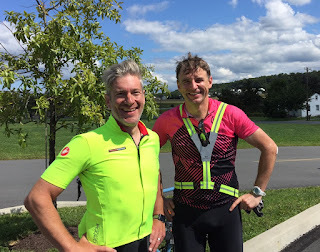 George continues to dream with me to come up with exciting new things to do with brevets and makes all the arrangements with our host, Victory Brewing. Jeff solo rode the course on his fixie earlier when an emergent work matter prevented me from joining him. He then came all the way from Princeton to help not only with rider check-in at the start, but hung out all day and checked in every finisher. These events would not happen without volunteers like this. Thanks to those who organized and helped with yesterday's "Victory to remember 200k." Conditions were excellent for a route that ran near and slightly overlapped February's Freeze Fest. I always feel like those "Amish plains" in Lebanon and Lancaster Counties have some wind, and yesterday was no exception, luckily temperatures were good for most of the day. The early start was at 47F and rose to 81F. Perfect! The variety of livestock was really amazing, from the teams of mules and workhorses to the young boys riding in that 2 person cart with their pony leading. It was really great. It's so much different and mentally uplifting when everything is green and people are out and about on a good summer day. Sean Connelly & Tim Creyts at the finish. Next up we return to our rando clubhouse in Quakertown in October for the fall classic 200/150. Stay tuned to the website and message board for details.